-Read the excerpt below from Jonah Goldberg's Jan. 8 commentary at USA Today. Egyptian President (and strongman) Abdel Fattah al-Sisi delivered a possibly epochal speech at Al-Azhar University in Cairo on New Year’s Day. More than a thousand years old, Al-Azhar is considered by many to be the epicenter of scholarly Islam. “I am referring here to the religious clerics. … It’s inconceivable that the thinking that we hold most sacred should cause the entire umma (Islamic world) to be a source of anxiety, danger, killing and destruction for the rest of the world. Impossible! “That thinking – I am not saying ‘religion’ but ‘thinking’ – that corpus of texts and ideas that we have sacralized over the centuries, to the point that departing from them has become almost impossible, is antagonizing the entire world. It’s antagonizing the entire world! … All this that I am telling you, you cannot feel it if you remain trapped within this mindset. You need to step outside of yourselves to be able to observe it and reflect on it from a more enlightened perspective. What is clear is that this is a big deal. Al-Sisi is doing exactly what Westerners have been crying out for since at least Sept. 11, 2001, if not before that. And yet his speech has been almost entirely ignored by the mainstream new media. The commentators and analysts at PJ Media have been all over the story, but there’s been silence from The New York Times, Washington Post, the news networks and other major outlets. Why? No doubt part of the explanation is that he gave his speech on New Year’s Day, when most journalists are hung over, following football not the foreign press. But another part of the explanation probably has to do with the fact that al-Sisi isn’t the kind of authentic Muslim reformer many Westerners wanted. Indeed, he’s too Western for some and clearly too autocratic for many (his treatment of the press is outrageous). They wanted the Muslim Brotherhood to succeed in Egypt, not be brought to heel by an Arab Pinochet. Moreover, al-Sisi sees Israel as a de facto ally in their shared battle against Muslim extremism, and that muddies the narrative that Israel is the cause of Middle East extremism, not the victim of it. Whatever your own view of the man, and whether you think he’s sincere, al-Sisi’s efforts to combat Muslim extremism – militarily and rhetorically – deserve closer attention, if not now then after the images from Paris fade. 1. What type of bias is Mr. Goldberg illustrating in his commentary on Egyptian President Abdel Fattah al-Sisi? 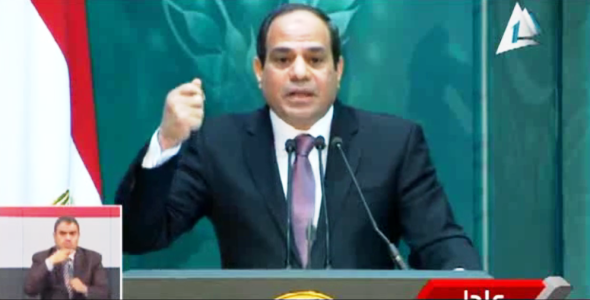 a) Why do you think major news outlets have not reported widely on President al-Sisi’s speech? 3. Mr. Goldberg asserts: “Whatever your own view of the man, and whether you think he’s sincere, al-Sisi’s efforts to combat Muslim extremism – militarily and rhetorically – deserve closer attention, if not now then after the images from Paris fade.” And some argue that, notwithstanding the speech at Al Azhar, Sisi has done relatively little to improve the situation of Coptic Christians in Egypt.